Not only does Gross-Loh take a supportive and nuanced view of parenting practices so that parents will feel part of a process of curious inquiry rather than under the thumb of yet another expert, she also brings a voice of reason backed by research to the more challenging issues of child rearing in our culture. Of particular interest to readers is evidence on how co-sleeping actually makes children more independent, how parents in other countries teach children to eat a variety of foods, and how we can foster independence in children at a much younger age than we might think. It is impossible, even in this age where so many of us live in countries other than where we were born, for parents to discover all these alternatives on their own. 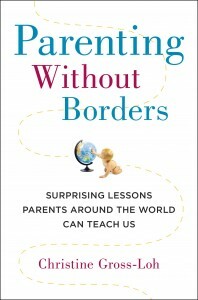 There are only so many cross-cultural experiences even the most fortunate among us can have, and this is where Parenting Without Borders does such a great service: Gross-Loh has done this research for us. I was a free-range child who somehow turned into a hover-mother, unable to watch another toddler grab a toy from my child and whack him without intervening. Gross-Loh made me reconsider: perhaps giving little children their own way and not holding them accountable is a fine approach, with redirecting rather than forced apologies or forced sharing. Could my forceful interventions be rooted in Puritanical notions of control, and could my later hovering with my older children, clearing their messes and driving them everywhere, be holding them back? Did I — did our culture as a whole — have the independence training period backward? I vividly recall visiting a friend in Japan, and observing how she exhibited no shame at her little one’s extreme temper tantrums. We are expected to be mortified when our kids lose it in the supermarket. But for my friend, it was nothing to blush about, and her serenity as she waited for the storm to pass was so unexpected that it stayed with me. One concern: how can this research be transferred from its original culture to another context where it may not fit? How, for example, can we learn from lunchrooms in Japan, where the whole culture has a tradition of appreciating the ability to try new foods, and learning to cook is part of the curriculum? At my childrens’ school in Canada, kids have ten minutes to scarf down a lunch sent from home, and kids are often taught that the food they should enjoy is a separate category entirely than adult food. How much can we cherry-pick best practices when we take them out of their cultural context? The danger, of course, is that these will become just one more consumer choice in a dizzying array of choices. The hope is that we will begin a real conversation on how to correct some of the weaknesses in our own culture’s approach.